The 500-in-1 Electronic Project Lab has everything you need to build 500 exciting projects all contained within it's own built-in carrying case. 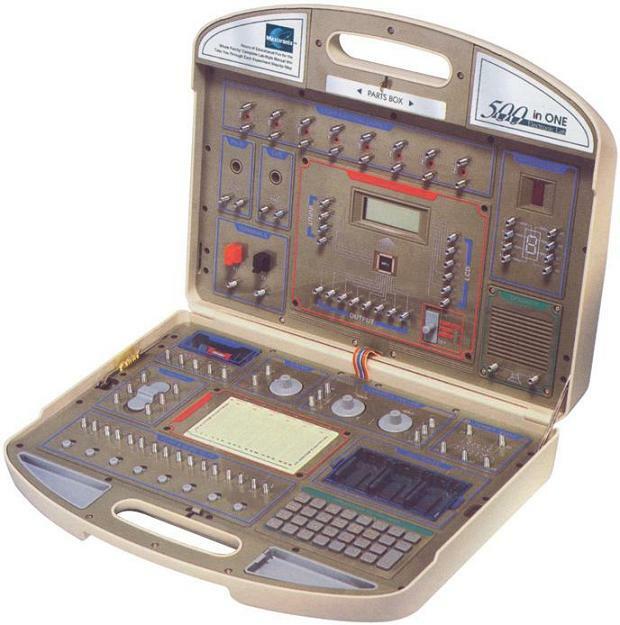 With this advanced kit you can learn the basics of electronics and put your knowledge to work creating 500 different electronic experiments such as, special lighting effects, radio transmitter and receivers, amazing electronic sound effects, cool electronic games and MORE! Also it includes built-in breadboard and spring wire clips for easy wiring of the components, and the LCD (Liquid Crystal Display) indicates the status of your experiments! You can build your knowledge of electronics by exploring amplifiers, analog and digital circuits, and learn how to read electronic schematic diagrams. The kit includes an extensive set of electronic parts including transistors, transformers, diodes, resistors, capacitors, phototransistors, CDs, integrated circuits, speaker, earphone, LEDs, and an LED digit display! The loose components fit in compartments on either side of the built in handle for safe storage. There is a fact-filled, illustrated, lab-style manual included. Requires 6 AA batteries not included. Ages 10 and up.